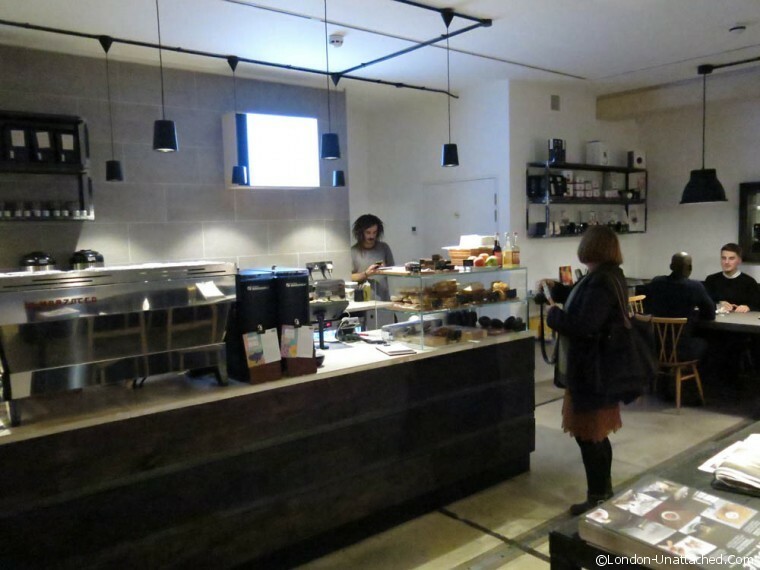 Tucked away in trendy Shoreditch, Origin Coffee Shop has a stripped back facade. The sort of place you’d only look twice at if you really wanted a cup of coffee and happened to be walking past. But, inside you’ll find a group of dedicated baristas, keen to take coffee further – to introduce and educate Londoners in the world of speciality coffee. Their passion becomes evident when you go downstairs into the teaching studio, where you can learn the basics about coffee – or if you prefer, have an introduction to coffee art. 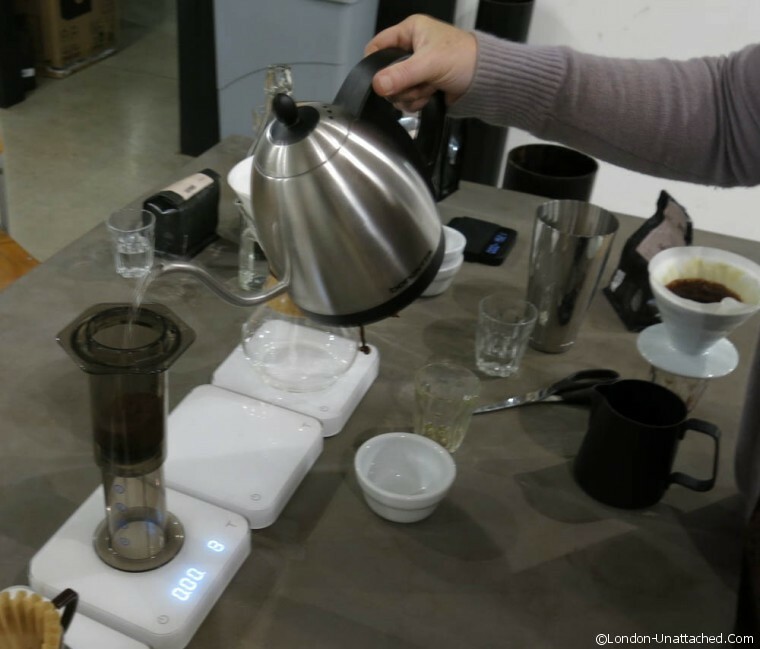 A bit like a science lab, the table was set with a whole range of different drip filter equipment. We started with a kind of reverse Blue Peter exercise, tasting coffee from freshly ground beans. It was fragrant and aromatic – bursting with all kinds of fruity notes. Next up, the same beans, but from a batch that had been prepared just a few hours earlier. The difference was sublime. Gone was all the complexity, instead we were left with a simple, pleasant but unexceptional black coffee. Will explained that Origin Coffee is based in Cornwall. Founded in 2004 by Tom Sobey, who developed a passion for speciality coffee when he went travelling in Australia, all their coffee is environmentally sourced and they we work closely with coffee farmers, aiming to make sure the coffee farms themselves are properly maintained and both farmers and workers are fairly paid for the crop. Cornwall is, of course, one of the foodie centres of the UK and Origin succeeded in setting themselves up as suppliers to many of the top restaurants there. 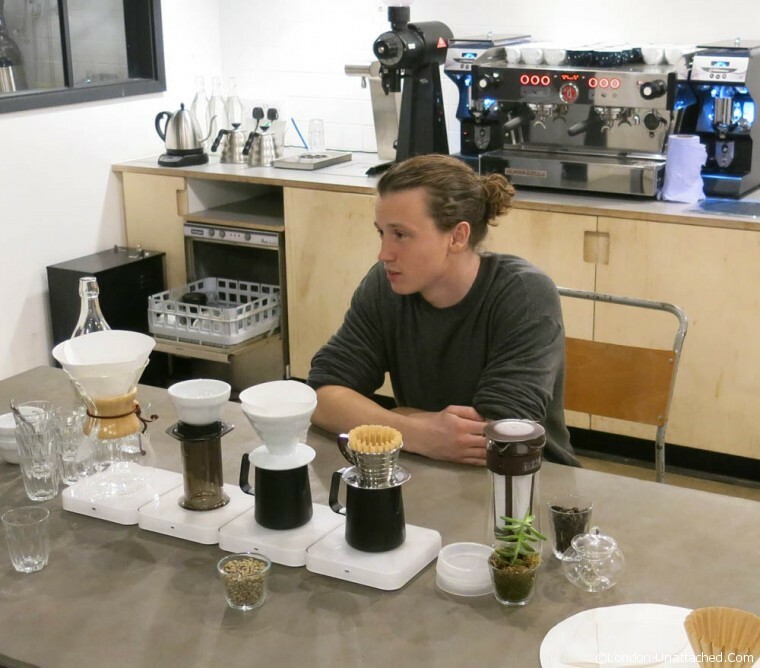 Once they got their hands on a coffee roaster, they expanded rapidly and now they have two coffee shops (one in Helston and the one I visited in Shoreditch) as well as the roastery. They supply to many of the top restaurants in the country in addition to selling retail coffee through independent shops and delis and over the web. 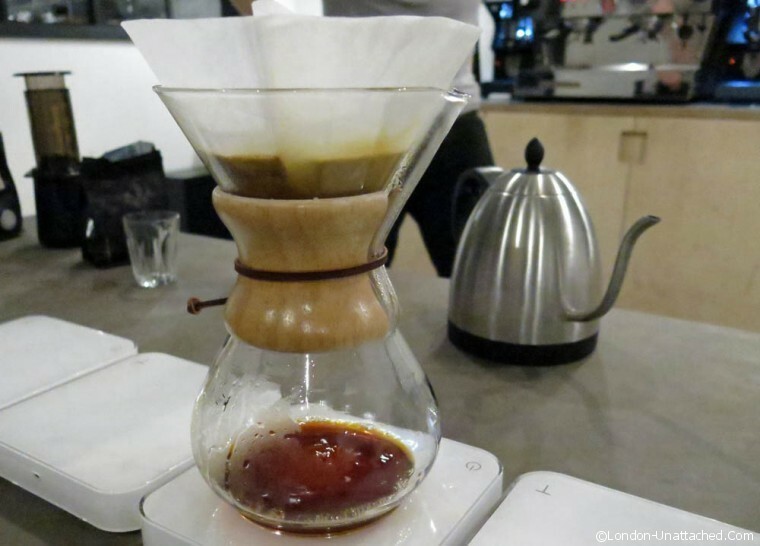 We tried brewing more coffee with some of the different jugs and filters. 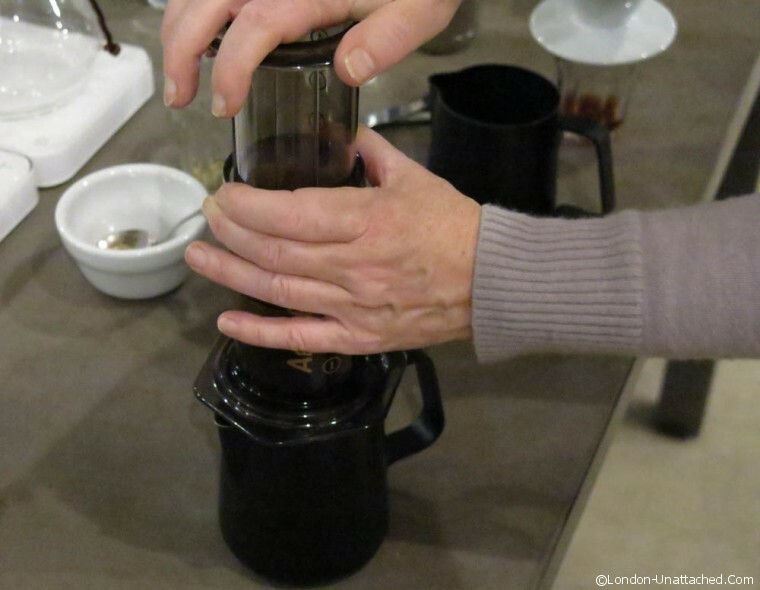 I was fascinated by the aeropress – it’s something I’ve seen and heard about but never used. As a simple way to make an excellent cup of coffee it cant be faulted. We learnt that it’s important to ‘clean’ the paper filter before you make coffee – by wetting it and throwing away the water that filters through. And, we learnt that one way of checking how fresh the coffee is that is being brewed is to look at the bubbles which appear on the top of the grounds as you pour water through. Apparently, fresher coffee will bubble more because there is more carbon dioxide being released. Every coffee at Origin has it’s own recipe. That involves the level of grind, the amount of coffee and water and the speed at which the coffee is brewed. Each recipe is designed to bring out the best in the individual beans. One commonality though is that you don’t make fresh coffee with boiling water. 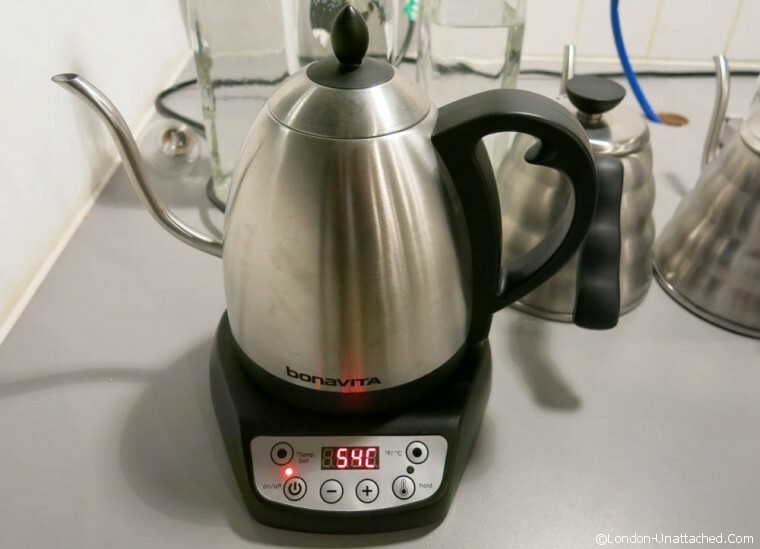 At Origin they have some rather fancy kettles that heat water to exactly the right temperature (89-90C), but Will recommended just boiling a kettle and waiting for a few minutes. We went on to sample the monthly special, upstairs in the coffee shop. 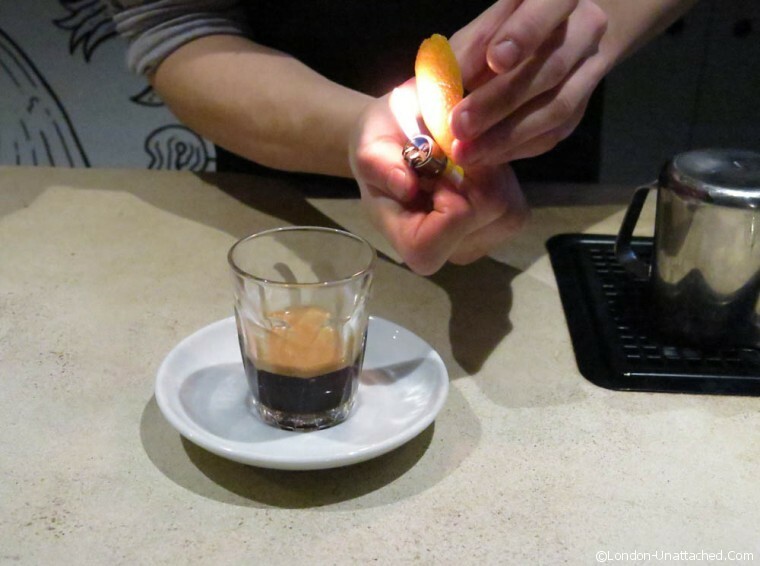 A mulled expresso, it was just a little overwhelming for me by this stage. I’d tasted so much coffee downstairs that I had a real caffeine buzz and could do no more than take a few sips of the expresso. My companion, Simon from By-Invitation, is a heavy black coffee drinker and he loved it! Will explained that part of the Origin ethos was to train and educate. In addition to private events, like the one we enjoyed, they run a series of SCAE training programmes dedicated to producing great baristas. The world of coffee is changing – and Origin are leading the way. This sounds amazing. I would love to take their class. I wonder if this brand is available in the US? I think you learned a ton of key things about making coffee! I don’t like coffee but I really think I would have found this interesting. Love everything about this post Fiona, from the Cornish brand gone good, to your thoughts on the aeropress as I ordered myself one on Boxing Day as I’m fed up of sifting coffee grounds through my teeth due to a leaky cafetiere! Big hugs for the start of a new year, here’s hoping yours is a cracker! How interesting. I tend to take my coffee for granted rather than savouring the flavour. I do too GG, I was really suprised at some of the contrasts – particularly by the difference freshly ground coffee makes.